Good morning! There’s a lot going on behind the scenes over here that I want to let you know about. I figured I’d just do a big update post, so I’ll get right to it. I can’t thank Eric enough for creating this recipe rating system for us. This is something that many of you have requested over the years and I am beyond excited to finally have it in place. 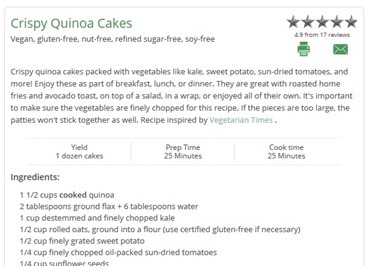 We installed it late last week and I’m happy to see the ratings flying in already for so many different recipes (especially for last week’s Crispy Quinoa Cakes recipe!). Your feedback is so important to us and I hope you find it helpful too! How it works: To rate a recipe all you do is select your star rating at the bottom of your comment and then leave your review in the comment box. 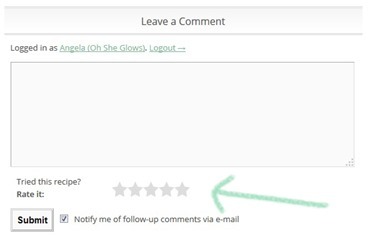 This will help you find reviews much more quickly as your star rating will show up next to the comment. 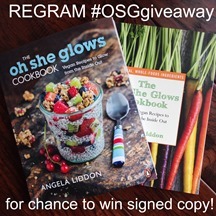 I’m giving away a signed copy of The Oh She Glows Cookbook (your choice of cover) on Instagram this week! The contest is open worldwide and runs until Friday. See my Instagram post for how to enter. Good luck! I’m honoured to be nominated in VegNews’ 13th annual Veggie Awards™ this year in the “Best cookbook of 2014” category and the “Best Blog” category. If you enjoy the blog and/or cookbook, I would greatly appreciate your support! There are a ton of prizes up for grabs, so head on over and vote for your favourite people, restaurants, products, blogs, cookbooks, and more! From time to time, I share quick and easy recipes on my Instagram account. This weekend, I shared this delicious, high-protein smoothie recipe that I’ve been making a lot lately. Head on over and check it out! 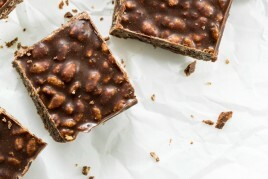 Also check out this recipe for my favourite coconut oil chocolate bar and a fav way to sneak in more calcium. I also recently created a new Instagram account, @theglowspot, where I share non-food related pictures. I mentioned this new Baby section on the blog several months ago, but I’ve been getting a lot of comments from many of you saying you had no idea it even existed. We decided not to put these posts in the RSS feed because I want to keep my blog’s focus on recipes, however you can find the link to this new section at the top of the blog and on the sidebar. 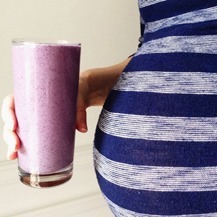 I’ve been using it as a pregnancy journal of sorts, talking about my journey, sharing pictures, and also a bit on prenatal vitamins and healthy recipes. I hope you enjoy some of the new features going on! I appreciate your feedback so feel free to let me know if you have any suggestions. And be sure to let us know if the recipe rating system is working for you. This website has been a labour of love over the past 6 years and I love finding ways to improve your experience. As always, thank you for reading, trying out the recipes, and sharing the blog with others! I’m not super active on instagram, but will have to start following you! I think everything you have been doing is wonderful! I follow your journey in both food and baby, and you are a total inspiration to me and my husband. I am finally pregnant after over a decade of trying, failing and finally coming to terms with infertility. Then, bam! We find out we’re expecting! Crazy! Thanks to your beautiful posts and healthy living options, my husband and I have been able to have a wonderful first year of vegan eating. We have no regrets, and have loved each of your recipes that we have tried. We’re so happy for your success, both professionally and personally, and applaud you for caring so much for your readers and fans! Congrats on your exciting news Cassie! Life works in mysterious ways, doesn’t it? I see your book in Chapters/Indigo SO frequently and I get super pumped and point it out to whoever I happen to be with at the time. I confess that I haven’t yet bought the book — its a bit of a splurge for me right now, so I think it will have to wait until after my wedding… BUT i’m going to jazz on over to your IG account to see what the scoop is for this contest! I always love your IG posts – i get ultra excited to try out your recipes… in fact, I have the necessary ingredients for your quinoa cakes and might just make them after work/gym tonight! thanks for being your amazing-awesome-glowing self! I wanted to let you know how much I love your weekly “baby” posts. Thank you so much for not turning you perfect, amazing, life altering and life saving food/recipe blog into a “Mommy Blog” and keeping the baby posts separate. With that being said, it has been so fun to follow you on your pregnancy journey. Your writing is funny, sweet, and endearing, and your new daughter is so, so lucky to have you as her mom! I also especially love the food and exercise anecdotes you share so the baby entries really tie into the overall theme of your blog and are very interesting to the types of readers who would visit your blog anyway. Great job! Can’t wait until that baby is born! Lauren, Thank you for this lovely comment. It’s great to know that the posts are appreciated. As a beginner vegan, my husband and I have been eating our way through your cookbook.I was so excited to see this new recipe rating system.This new system will help us figure out what to try next! Looks great! What recipe app/widget to you use to post recipes? Eric created the recipe uploader especially for the blog. I do know there are free recipe widgets/plugins you can find through Wordpress though! Easy Recipes is a popular one I think. I am loving the new rating system. Your blog is so well done. Great work!! Just wondering… I would ask this on your Instagram post but I’m not on it… where do you buy your hemp hearts? I’m really interested in trying them but not sure if some brands are better/cheaper than others. Thanks in advance! Love all the new stuff Angela! Lucky I saw this now as I just entered the fabulous contest! I just wanted to tell you congrats for everything that’s happened to you in the past year (and even six years!). Your blog is truly inspiring and I absolutely love the recipes and the easy-going vibe! As a vegan teen, it’s awesome to know that I have plenty of delicious options. Your blog also helped me slowly recover from anorexia (still in the process though haha) and I’m very grateful. I saw that there was a contest for the signed book and I was wondering if there would be a similar contest open to those who don’t have an Instagram account? PS- you’ll def make a terrific mom, and good luck! Thank you Gaby – I’m so happy to hear you are on the road to recovery! I don’t currently have another giveaway planned, but I will keep one in mind for the fall. I’m sure I can run one on the blog for a signed copy. Hi! My daughter told me about your lovely website last year–thankfully!–and so I ordered her a copy of your cookbook, because I knew she was a fan. Well, as soon as I saw it, I had to get one for myself, and have worked my way through almost all of the main course meals so far (first time I’ve done that with a cookbook since I bought the Moosewood Cookbook back in 1985!). It’s tasty, meals are a big hit with veggies and meat-lovers alike, and I don;t find myself tweaking recipes due to overly laborious instructions or wonky ingredients. So, thank you! Regarding the technical aspect of the blog, just as a heads up, I had a craving for the chocolate hemp smoothie just now, and searched for hemp smoothie, and then just smoothie, but it didn’t turn up the recent recipe (with the red and white straw), so I searched under the main recipe heading of “smoothies” under beverages, and found it. So maybe it needs a “fuzzy search,” (I think it’s called?) so you can find recipes even if you don’t recall the exact name? Cheers! Thanks for letting me know about your search issues. I just did a search in the search bar (we’re talking about the search beside the “press” link, right?) and the smoothie came up as the first hit (under the ad) for me when I searched “chocolate hemp smoothie”. I’m not sure why it’s not working for you. Let me know if it keeps up! Sigh, Murphy’s Law, I guess, or something…of course it worked when I tried it just now! Maybe in my pre-chocolate state yesterday, I typed it in somewhere else. Obviously, the solution is to never let my chocolate levels drop that drastically again! Yes bad things can happen when the chocolate levels get too low! ;) Glad it worked today. If you have the problem again, just let me know. Right now we have about 70 or so recipes that can be rated…and gradually we’ll be adding ALL of the old ones into the new system! So in due time. :) I’m glad you love the rolo recipe so much…it’s one of my all time favs! Just made a batch last week. No hints yet, but hopefully when we get closer! This was my question too! I have a few recipes that are in HEAVY rotation in my house and have been for a while – specifically the butternut squash mac’ n cheese. I want to go in and give our faves the five stars they deserve. Just Voted!! You were, of course, my fave in each category that you were nominated in! OBVI!!!! I wish you had been able to get the star ratings retroactively! I have some favourites I would like to see shine. (Just posted a comment on that six star Eggplant Parmesan. Just wanted to let you know that I LOVE that you keep baby stuff and recipes separate! It is just the worst when you read a blog for the recipes and then the blogger gets married or pregnant and all you get are life updates! My sister and I always joke that when a blogger gets pregnant we have to stop reading the blog! Thank you for finding a way to share your exciting news in a way that doesn’t interfere with the recipes! Agree with everyone saying how glad I am that you’re keeping baby stuff separate. I’m totally excited for you and I do click around that portion of the blog now and then, but I’m really here for the recipes. Thanks for respecting that! Just voted for your blog and cookbook in the VegNews survey :) good luck! Here’s some unsolicited advice: take all the time in the world when the little one comes. Her size is inversely proportionate to the amount of energy required. Also, when the baby sleeps, SLEEP. Trust me, the dishes can wait. I am very excited to read that you are developing an app! I love you recipes and look forward to seeing what you create next :) Also, I voted for “OhSheGlows” at the Veggie Awards- you deserve to win!!! I’m so happy you decided to take a chance on the cookbook! And even happier you have enjoyed so many recipes so far. :) Thanks for your support! I would love to rate the shredded kale salad but there are no stars to click on with the new rating system. It is my absolute favorite salad in the whole world and I bring it to every potluck I go to. It always gets rave reviews. Do you mean this kale salad: http://ohsheglows.com/2013/11/25/the-best-shredded-kale-salad/ ? I just clicked on the comment section and I’m seeing the stars (below the comment box). Great updates to your website. I love your site. I am not vegan, but I am lactose intolerant. It is so hard to find recipes without some type of milk in it. Your caulipower pasta, and your butternut squash “mac n cheese” are my favorites! I love hearing about Sketchie because i am a cat person. I have two: Lola and Lucy. We have not gotten a Sketchie update in a while. How is he? Thank you Syd. :) Sketchie is doing pretty good, thank you for asking! He bounced back from surgery quite quickly and remains his silly/active self even despite the medication. Actually, we don’t really notice much of a difference in him at all which is great and his blood work is coming back fairly good all considering. Hoping it continues and just very grateful for the time we have with him. Hi Angela, I just wanted to tell you that I consider your cookbook and blog part of my “health team”. I use your cookbook weekly as I prepare my meals for the week and the sound nutrition of your recipes have contributed to my now normal cholesterol and 27 pound weight loss. I appreciate the way you have designed your blog and book. They are easy to follow and the recipes are very tasty. I have learned so much about nutrition and how to have a healthy relationship with food. I am eternally thankful to you. I know you do not know me, but you have helped me change my life. THANK YOU! I would love to win your cookbook! Even if I don’t win I will be purchasing the book soon because I love your recipes! They always come out great. The blueberry hemp smoothie sounds so good. I love the combination of blueberries and bananas in smoothies and adding hemp is a great idea for additional protein. The coconut oil dark chocolate sounds amazing as well and so easy to make! I have all those ingredients in my pantry so I will definitely be making it today. Alright, it is about time I write this…. after being a vegetarian for 20+ years, I had tried (unsuccessfully) to go vegan on a few occasions but was miserable. Then I stumbled on your blog and suddenly the clouds parted and angels sang (ok well not literally but I probably sang a little). I use your recipes all the time. I finally bought the book and was quite pleasantly surprised to find even more wonderful, easy recipes. Now, much of my office is enjoying your recipes (chocolate chip cookies anyone?) and several non-vegans have bought the book and are taking the vegan plunge. Dang, now I want cookies. Thank you for sharing your recipes with us. Your site is a treasure trove. Hi Ellen, Wow, thank you so much! You don’t know how happy that makes me to hear. And thank you for passing it along to others! I hope you all enjoy lots of yummy vegan recipes to come. Your blog keeps getting better and better, I am so impressed! I think the rating system will be great. Will we be able to search for all 5-star recipes? Though I’m sure they are all worthy of 5 stars! I’ve started following you on Instagram and voted for you in the veggie awards, good luck! Love the new rating system!! (Thanks Eric!) It would be awesome if eventually there was a way to search recipes by their average rating. A lot of recipes I find online are for at least 3 or 4 people. I seem to buy more groceries than I need to prepare the recipes, and end up wasting some of them. I’m new to this, and as a single person, what do you recommend would be easiest to make the recipes smaller for just me? Also wanted you to know some of your recipes are being used in my ARBONNE 28-day detox group! Love them! So exciting! I love the baby section on the blog, it’s awesome! Good luck with everything! I’ve been vegan for over a year now and your blog has been such a huge inspiration! I just want to thank you for sharing such wonderful recipes but also for all the positive vibes that you transmit (all the way accross the world it seems!) You’ve made me so happy so many times by doing what you do and I just thought you should know! I wish you and Eric and your baby a lot of love and happiness! Hi Claire, Thank you so much for your lovely note! I had to write to thank you for maintaining this beautiful blog, and for including the advisories on the recipes such as “Vegan, gluten-free, oil-free, soy-free.” As a vegan who is trying to limit her sugar and gluten, having these easy disclaimers is just invaluable. 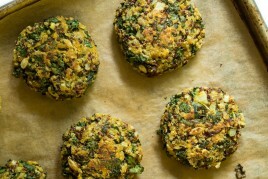 Thank you also for the sheer beauty of the blog and your cookbook. I give your cookbook to everyone now, as proof that a plant-based diet doesn’t mean eating tree bark and root vegetables. Blessings to you and your new addition!